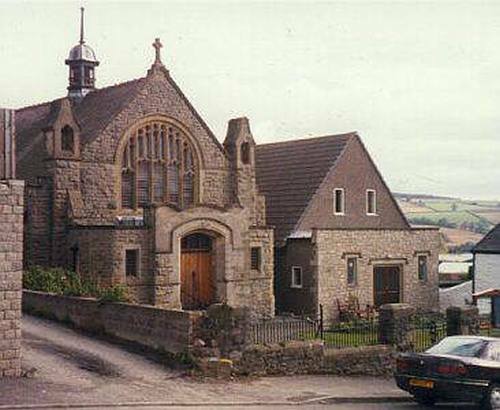 This chapel was built in 1904 at a cost of about �500 and had seating for 200 people. The architect was Mr J. H. Pickard of Whitchurch and the builder was Mr T. Speake of Chuirch Stretton. The foundation stones were laid on the 24th February and it was intended to open the chapel on the 27th July, but it was delayed until the 24th August 1904. It is still in use for religious services by the Methodist Church. This chapel replaced the previous chapel on the same site, which had been built in 1863-4 at a cost of just over �9. The chapel was 42 ft long by 27 ft wide, and had 12 windows, four on each side and two at each end. The architect was Mr W, Pugh and the builder was Mr Thomas Gough of Bishop;s Castle. The foundation stone of this chapel was laid on 16th October 1863, and the first service was held on 14 February 1864. The chapel was built of brick with a Bath stone string course. The chapel was a replacement for a chapel built in Union Street in 1831 (opened on 25th September 1831) at a cost of �0, which had become too small and out of repair by 1863.The 1831 chapel had seating for 150 worshippers and had 75 and 99 worshippers at their afternoon and evening services respectively in 1851.